Fishermen Mobilize World Ocean Emergency - Vote for Our Oceans! 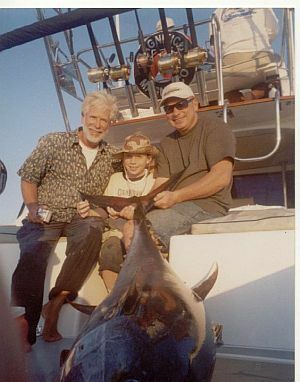 Puerto Vallarta fisherman Phil Kerr celebrating with Colorado's Jake Anderson fulfilling his dream of pulling in a big fish with his dad Luke. Puerto Vallarta now has a coral solution to continue this survival skill! Puerto Vallarta, Mexico - In October the World Wildlife Fund released a troubling report on CNN, that two thirds of the world's marine and wildlife could be gone by 2020, that's just 3 years from now! And it is mainly from rising air and ocean temperatures and over farming, logging and fishing. A main problem is that the warming oceans are killing the coral, which are the nurseries of most fish, along with mangroves. Fortunately, Vallartans can be relieved and proud, but just for a moment, that we have "the only solution that regrows coral as the oceans warms." It was proven by September's test in Punta Mita by the University of Guadalajara, which the Mexican Government relies on for science. "This UN team's Oceanic Resuscitation Technology regenerated coral a record 5 inches in 5 weeks that sometimes takes years," reported marine biologist-professor Maria Elena Ruelas. "My fellow fisherman and our international clients are now mobilizing to help restore the missing coral here and bring this solution to marine biologists in their countries. 15 years ago these clients could catch (and release) marlin and dorado in Banderas Bay, but now they need to go out 50 miles, and most of our Humpbacks are missing," said Phil Kerr, a local fisherman. This emergency was verified in September by U.S. Senator Bernie Sanders, who said that global warming is accelerating and more dire than projected. It was exemplified by Rio's infectious waters and Zika Mosquito epidemic. Both are increasing unless we mobilize, warned Vice President Gore. That is, according to Popular Science, because August Tied July For Hottest Month Ever, and already 40% of our oceans are unswimmable and fishable, and OVER 60% lacks sufficient oxygen to support marine life. So everyone, including my fellow Olympians, needs to wake up and help so the Tokyo Olympic oceans are swimmable in 2020. Given this 3 year crisis, who knows how this affects skiing at the 2018 Winter Olympics in South Korea and worldwide? That is why VP Gore agreed to be Hillary's Climate Change director. So if you believe in science, this election today is critical to the bright future of all our children. The "catastrophically bare" Great Barrier Reef, Jamaica and Hawaii are working with our UN team since "nothing else has worked after wasting millions on other solutions." The Good News is this Oceanic Resuscitation Technology also restores plankton that flows through the ocean and are the seeds for the coral that feed on toxins that restore our turquoise waters, and feed the whales and fish. "Plankton also converts CO2 to OXYGEN more than all the rainforests and plants," said National Geographic. So for the same budget this technology is also the fastest way to get the planet down to 1.5C, critical for extending snow and shorelines. By this technology also bringing back our beloved whales to our bay and ports worldwide, it spins a Life-Saving Cycle. Scientists just discovered the whales' tails stir vital missing nutrients from the depths up to the surface to significantly increase the plankton, coral, and fish, to reduce CO2! See how the whales streamline restoring our oceans, so they must now be protected worldwide as critical heroic saviors of our oceans and getting us to 1.5C, in this 5 minute video. "Given we are all interconnected, and our Ocean is Puerto Vallarta's No. 1 economic draw, we fisherman and everyone worldwide need to unite to solve this ocean emergency for ourselves and our children," said Kerr, a Cherokee. Groups are collaborating and mobilizing as never before in history! But we are still headed toward this extinction in 3 years, with our suffocating oceans most vulnerable. Respected scientists say if we collaborate more and ACT, we can prevent an ocean crash leading to all life ending. "I am so happy to learn there is something we can do now to restore our oceans," said Kerr's Utah client Ned Ludlow, a director of a major food bank, after euphorically catching and releasing a marlin last week. Also "On fire to fix our oceans in 38 months" is a soulful new Rock star, Spencer Sutherland. 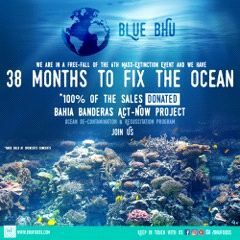 He teamed with bhufoods.com, a delicious organic protein bar company to funnel 100% of their sales at events to Puerto Vallarta's UN team to restore the coral in Banderas Bay plus get the word out to the youth who are affected most, since we realistically need to at least double our efforts right now. So thank you for joining our growing heroic team to win this Race to Save our Oceans and Animals by sharing these emergency solutions and supporting those in the front lines, prioritizing this ocean resuscitation. Our Vallarta Saludable (Healthy) team has also collected other strategic cost-effective solutions to get down to 1.5C. They were either praised or suggested by a Nobel Prize winner, environmentalists, governments, Olympians, US Ski leaders and World Youth leaders. Plus see how we can freely heal the spiritual side of Mother Earth. Read more at musewire.com. For more information, press, or to make donations to restore PV's coral or your ports, contact Vallarta Saludable at NAOTF.org. Donations are tax deductible in the US and Mexico, thanks to using our Native American Olympic Team Foundation umbrella. Thank you Creator for guiding us to restore Paradise and help our turquoise oceans ripple for all our children!